Harrah's was a special kind of booking - an all expenses paid ski vacation really. We had our band with us from the British Invasion tour, so we felt relaxed and confident on stage with them. No special moments stand out; the whole thing was special to me, except for one extraordinary moment. That was when my son, James Patrick Stuart, played drums - now that was special! I do wish we could trace the video of our last performance. Somebody shot it and somebody has the footage. Who is that person and where are they? I'd love to get my hands on that video! Sometimes I wish we'd continued playing engagements two or three times a year, but Jeremy wanted to act more than he wanted to sing, so that was the end of that. I don't resent his decision. I have no right to expect someone to do what they don't want to do just to suit my needs and wants. So, in the words of the current vernacular, "It's all good!" 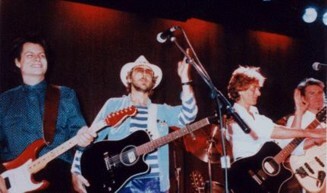 Chad & Jeremy's final night at Harrah's, Lake Tahoe on March 8th, 1987. This tape was recorded from the soundboard and has been painstakingly restored for optimum sound quality on this disc. The bonus "A Summer Song" is a studio recording from 1984, done for TV miming purposes. It was recorded at Spoiled Brat Studios in LA. The second bonus track is the FIRST C&J TRACK IN 15 YEARS. It's a specially recorded version of "Yesterday's Gone" done in April and June of 2002. All tracks are in mono except the new "Yesterday's Gone" remake. This disc is the first ever Electric Paintbox release and is exclusively available through the official website. In Concert 1987: The Official Bootleg IS EXCLUSIVELY AVAILABLE FROM THE NEW CHAD & JEREMY OFFICIAL ONLINE SHOP.